This article will explore one way to use open source tools (i.e. 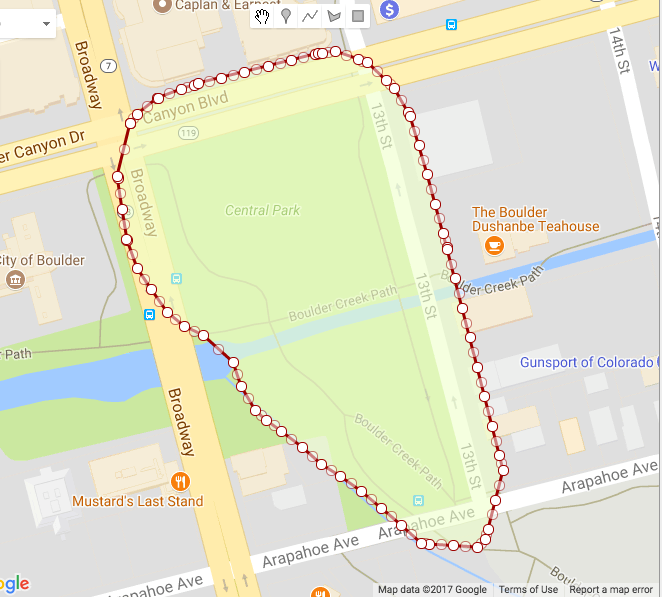 PostGIS and Java) to create a Buffer around a Polygon shape. 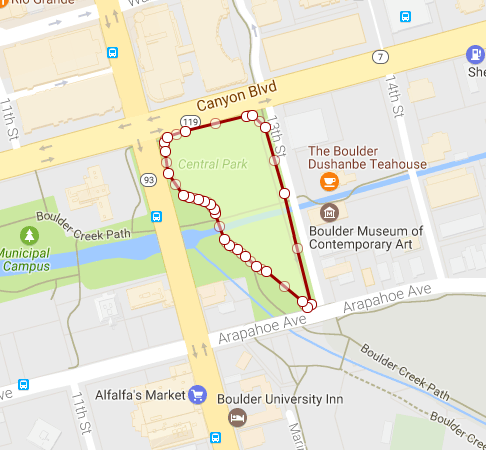 We will use Central Park in Boulder, CO as the Polygon in our example below. 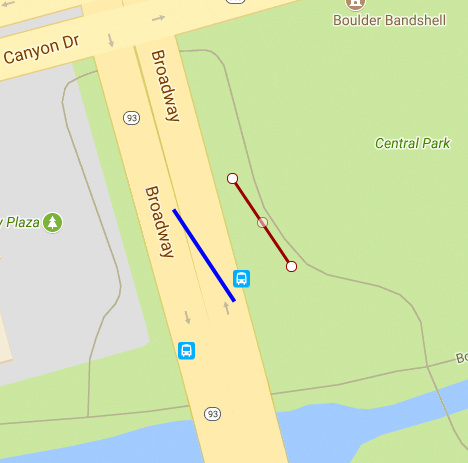 This procedure was developed to allow for automatic detection of adjacent roads to city parks and lakes (using OpenStreetMap data). Creating Offset Curves – for each edge of the Polygon, draw a line that is parallel and the same length as the edge, but falls outside of the original Polygon (these lines will be referred to as Offset Curves). Take the Concave Hull of all of the Offset Curves – the Convex Hull will look like an enlarged version of our original Feature. Remove the original Feature geometry from our enlarged Polygon – after removing the original Polygon, we will be left with our Buffer. Below is a visualization of the strategy we will use to generate the Offset Curves. The original Polygon edges are in red, while the Offset Curves are featured in blue, and fall outside of the original Polygon. We can start by looping through all of the Polygon edges. Essentially what we are looking to do here is split each edge into its own distinct LineString. I have accomplished this by exporting the Polygon as GeoJson, and then using a Java snippet to loop through each of the GeoJson coordinates and package each pair of coordinates into a WKT LineString. The Java snippet below will read in the GeoJSON, and return an ArrayList of WKT LineStrings. We will need the WKT LineStrings in the next step. 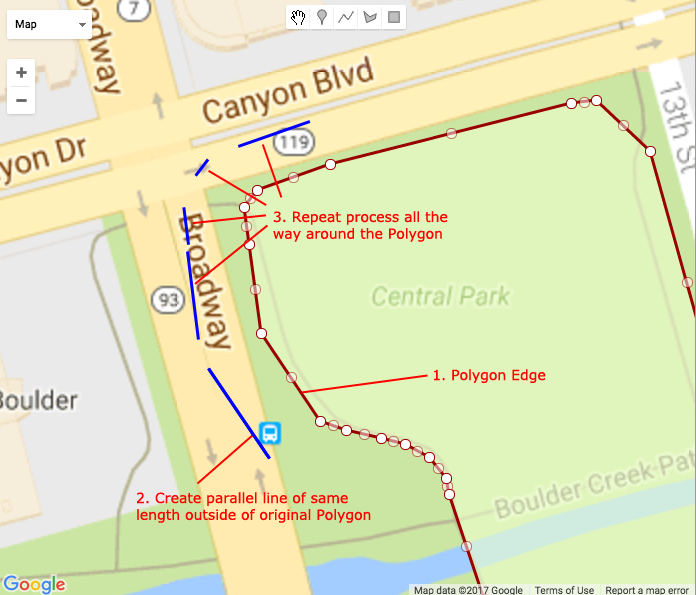 We need to repeat this process for each of the Polygon Edges. Once we have generated the Offset Curves for each of the Polygon Edges, we need to assemble all of the Offset Curves into a new Polygon (which will resemble an “enlarged” copy of our original Polygon). We can pass an array of all of our Offset Curve WKT LineStrings into the ST_Collect() PostGIS function to assemble them into a single MultiLineString. We can then pass the MultiLineString into the ST_ConcaveHull() PostGIS function to get our “enlarged” Polygon. An example PostGIS query is below; please keep in mind that the number of Offset Curve WKT has been drastically abbreviated for brevity. Once we have assembled our “enlarged” polygon, the last step in identifying the Buffer is removing our original feature. We will use the ST_MakePolygon() PostGIS function perform to essentially create a new Polygon with our “enlarged” polygon WKT as the outer LineString (first parameter), and supply the original feature WKT as an interior LineString (second parameter, supplied as an array). When defining Polygons in this way, the Interior shapes will be removed from the exterior shape. Below is an example PostGIS query to perform this operation. Notice to usage of the ST_ExteriorRing() function; this is strictly employed to convert our POLYGON geometry to a LINESTRING, which is required by the ST_MakePolygon() function. I have included the full “expanded” and original polygon WKT geometries below – I apologize for the cumbersomeness! 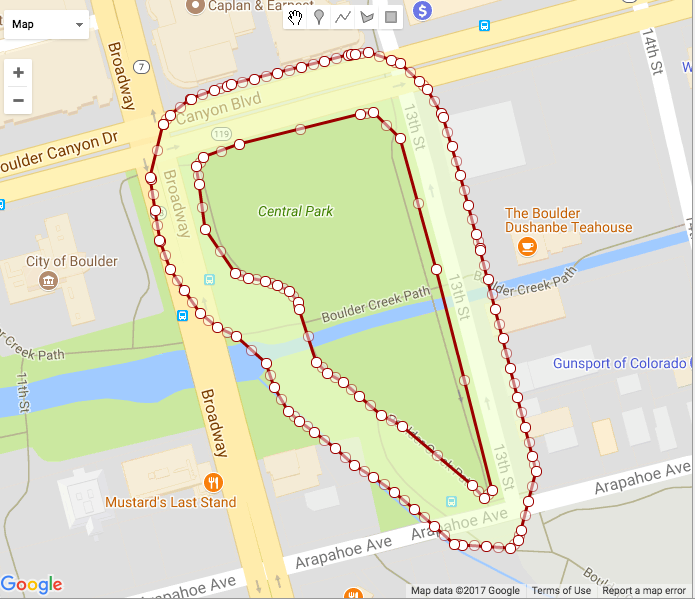 After executing the query above, we will be left with only our Buffer– notice the original park geometry has been removed. Quite a few steps just to expand a Polygon if you ask me. It feels good to automate this process in Java so that the logic can be re-used for more than one shape!